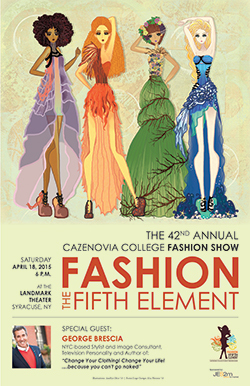 Students in Cazenovia College’s Fashion Design and Fashion Merchandising programs will present the College's 42nd Annual Fashion Show, "Fashion: The Fifth Element," on Saturday, April 18, at 6 p.m. at The Landmark Theatre in Syracuse, N.Y. This year's show, set to portray the trendiest styles in the industry, will be headlined by special guest George Brescia, style consultant, resident fashion expert on various popular television shows and author of "Change Your Clothes, Change Your Life: because you can’t go naked." All elements including staging, choreography, graphic design, photography and music is all produced solely by the students of the College’s Fashion Show Production class. Thirteen fashion designer seniors will present their capstone collections. Nine of the fashion merchandising seniors will also display their talents, as they have coordinated to produce the show. Admission is $17 for adults, $12 for students, and free for children under 5. For more information or to order tickets, visit www.cazenovia.edu/fashionshow; call 315-655-7043; or email fashionshow@cazenovia.edu. Stay connected with the show by following @CazFashionShow on Twitter and Pinterest, and visit the show's official Facebook page Cazenovia College: Annual Student Fashion Show.